Social Policy and Society is an international academic journal sponsored by the UK Social Policy Association. The journal welcomes stimulating original articles that draw upon contemporary policy-related research and associated developments in the social sciences. Each issue contains peer reviewed articles reflecting topical debates and issues within social policy and uniquely, a themed section, edited by a Guest Editor(s). Every themed section includes an introductory piece, a set of peer reviewed articles, a selected review of the key literature, plus a guide to key sources in the area. All articles need to be of a high academic quality and should also be accessible to a wide readership which includes policymakers, academic staff and students within and beyond the United Kingdom. 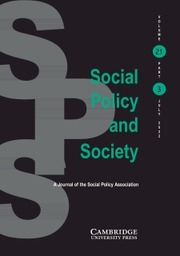 Social Policy and Society is part of the 'Social Policy Package' along with the Journal of Social Policy. SP&S has been accepted for indexing in the Clarivate Analytics Social Sciences Citation Index and will receive its first Impact Factor this summer. To celebrate this exciting development, the editors are pleased to offer free access to the most-cited articles from the last two years. Introduction: Parenting Support in the Nordic Countries: Is there a Specific Nordic Model? Parenting Support in Europe's North: How Is It Understood and Evaluated in Research?